Antmee: A Bag Finally Finished! Pleased to get this bag finished! It's been nearly done for quite awhile now. Some hand beading does make a simple bag look a bit moorish. Even though it took some time to do, I am glad I did it. A simple tote with raw edges. My brother came across this nice floral fabric and handed it over to me! 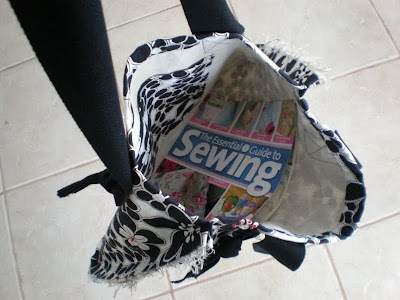 I have lined the bag with linen and added a pocket. Could make a nice library bag! I still have some of this fabric left, and thanks to Cyndi from bluebirdswing I have another bag project in mind for this fabric! The "Phoebe Bag" designed by Rebeka Lambert of the blog artsy-crafty babe. Really lovely, definately worth the wait! very very beautiful, your beading is exquisite, and really lifts it to the next level, well worth the wait. Go Kylie! The bag is gorgeous especially with the beading. This is beautiful and I so love the bead detail. Kylie this is just fantastic! I love the beading! I posted a couple of pictures with a link to your blog on my Show & Tell which will be published tomorrow. I have one every Friday. Just email me next week, if you would like to have something else featured at homemaking@eastex.net. Show & Tell is open to everyone. Wow! beautiful work! I love your bag - the beading is really nice! 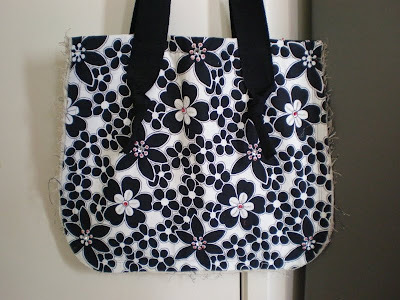 And I'm a big fan of the Phoebe Bag - it's a relatively quick project, and such a cute bag! 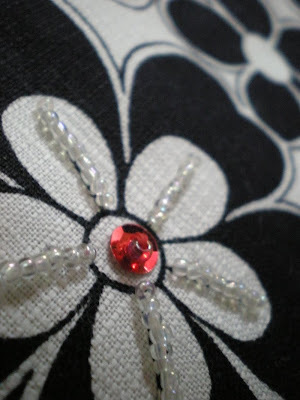 I love the blingy bead look! It finishes the bag. Hi Kylie, I just I wanted to tell you that I nominated you for the Sunshine Award..because you are one of the people who has really encouraged me these last few months...so thanks! I've listed your blog for tomorrow's post and linked it back to here. If you want to copy the sunflower award on your sidebar, you are welcome to. It's on the post. cute fabric ,great work !! VEry nice! 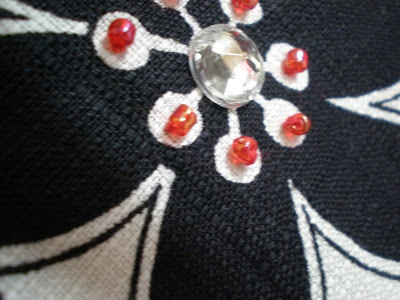 I like this beads details! I love the beading on this bag! What a great idea! Now I will be looking at large prints in a new light!